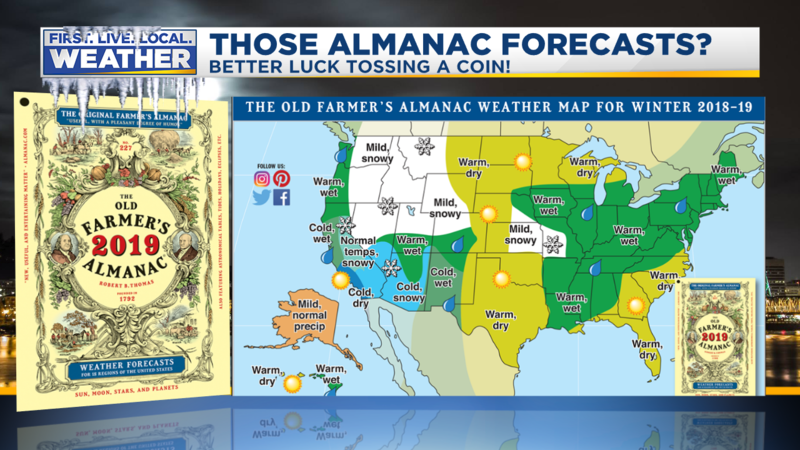 Now the Farmer’s Almanac forecast. Yes the apostrophe is in the correct place on this one. 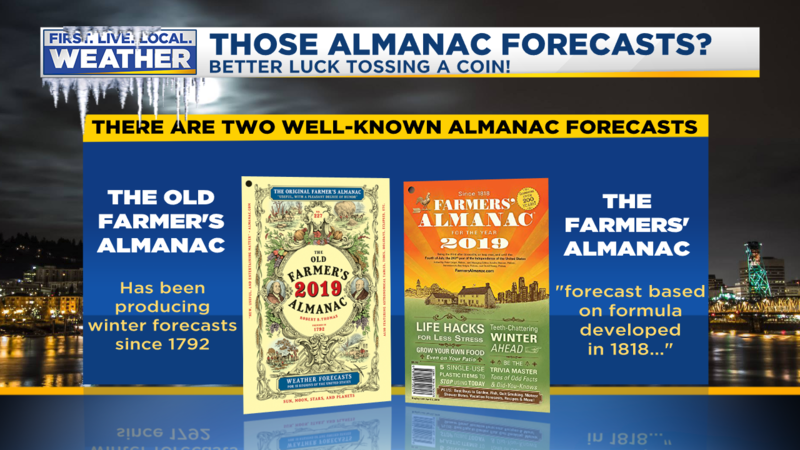 Jan Null at Golden Gate Weather Services here has checked the Old Farmer’s Almanac accuracy in the past, rarely does it do well. 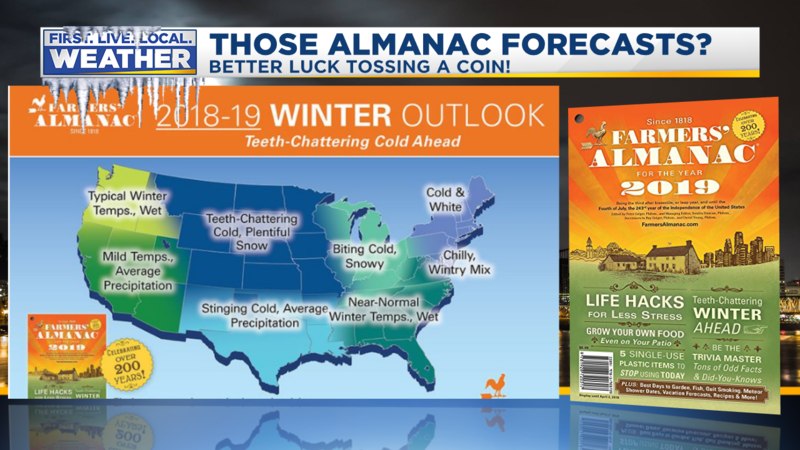 Brian Macmillan and I put together a presentation several years ago based on 4 winters of Old Farmer’s Almanac forecasts. 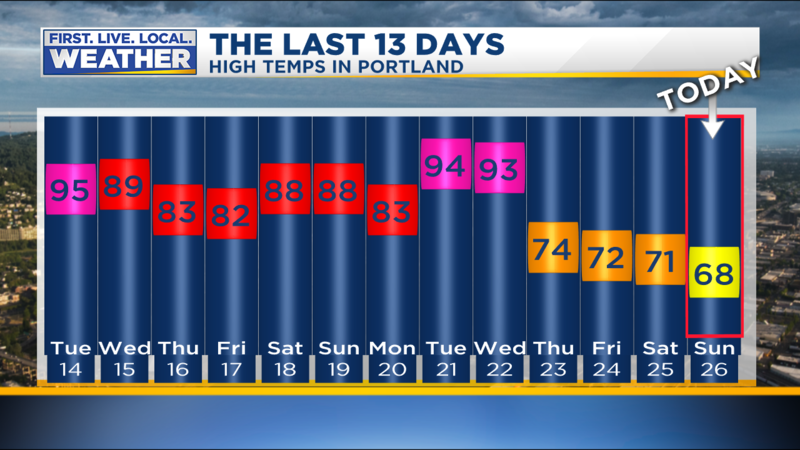 We didn’t analyze any sort of “snow/cold” forecasts because those are quite subjective; just how the temp and precipitation forecasts compared to reality here in Portland. 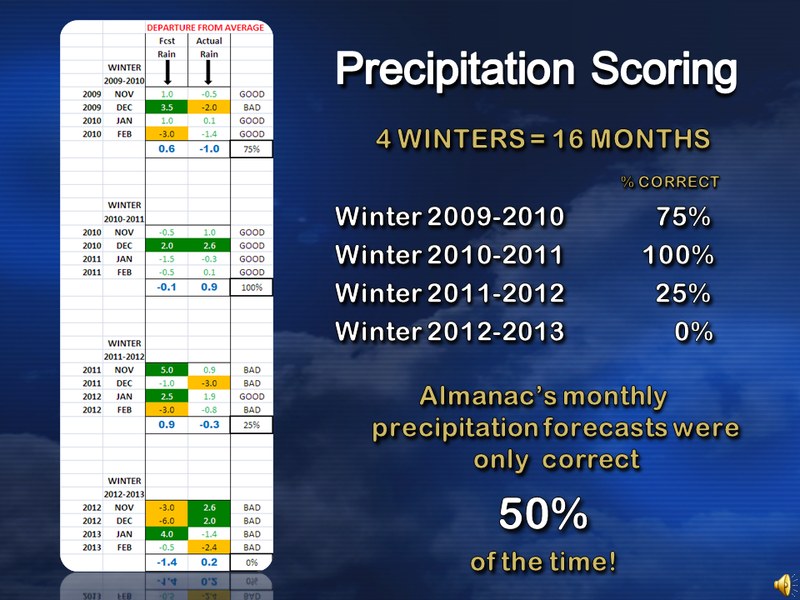 The Old Farmer’s Almanac was correct on precipitation anomaly (month-wise) only 50% of the time during the 16 months we analyzed. As you can see the temperature forecasts (below) were even worse…OFA is wrong far more often than right. The conclusion? These forecasts are often terrible. I’m quite confident no one is able to forecast daily, weekly, or monthly…many months ahead of time. Hasn’t it been nice the past three days? After the searing mid-summer heat this week has been glorious…definitely a late-summer or early fall feel out there. Today we made it into the mid 80s after a comfortable morning mainly in the 50s and 60s. The hot upper-level ridge of high pressure that’s been so persistent since mid-July has moved well offshore, taking the heat with it. There is a weak upper-level system passing by the next 24 hours; it’ll give us a strong push of marine air tonight. Expect plenty of cloud cover and even spots of drizzle Thursday morning. It’s a bit hard to read, but the black line shows decreasing moisture since the showers in mid June. Then a quick bump up this past weekend brought moisture levels back to average for late August. 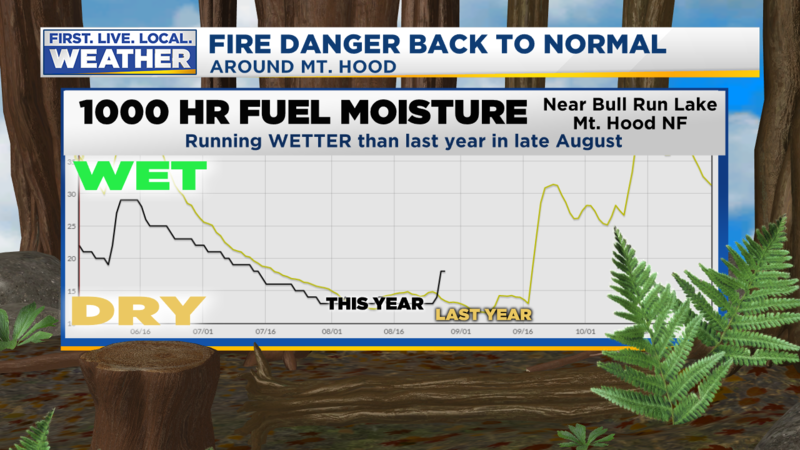 Notice last year (in yellow) moisture levels generally dropped through the first few days of September. Then of course we had that miraculous deluge in the mountains mid-September, ending the fire season early. We’ll see how it plays out this year. 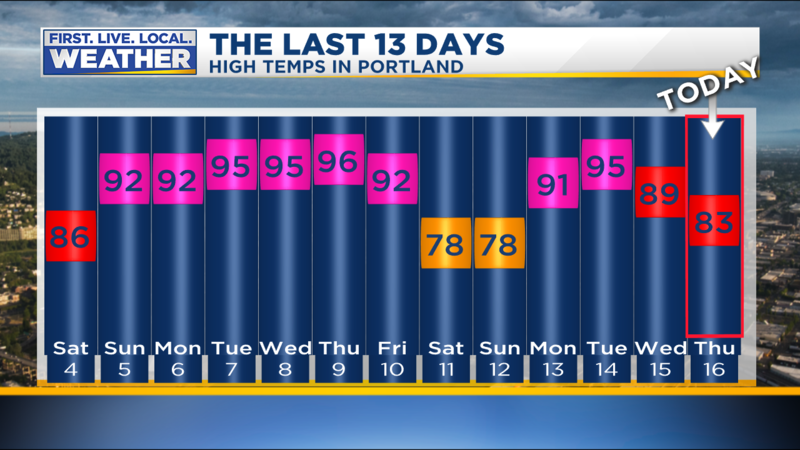 The average date is September 8th in Portland. My guess is that we have another 90 degree day coming at some point next month since temperatures the next 10-14 days will likely run near to above average. 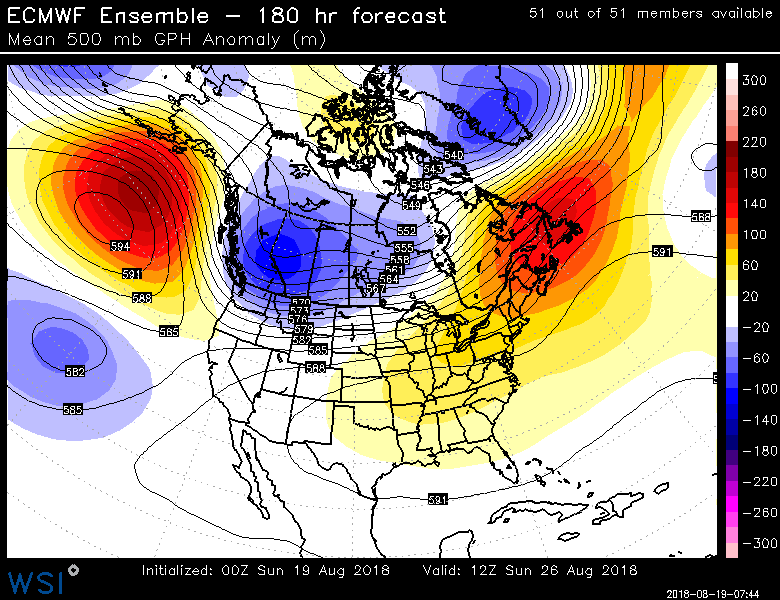 Weather forecast models did a great job showing our “endless summer” was about to…end last week. Or at least summer will be taking a prolonged break. Look at the last two weeks and you see the big change Thursday. Of course what we REALLY need is a huge soaking. It would be nice to see 2″ of rain followed by sunshine and 80 degree weather (personal opinion of course). This is an incredible number that shows you how dry we’ve been. The past 4 months…since May 1st. 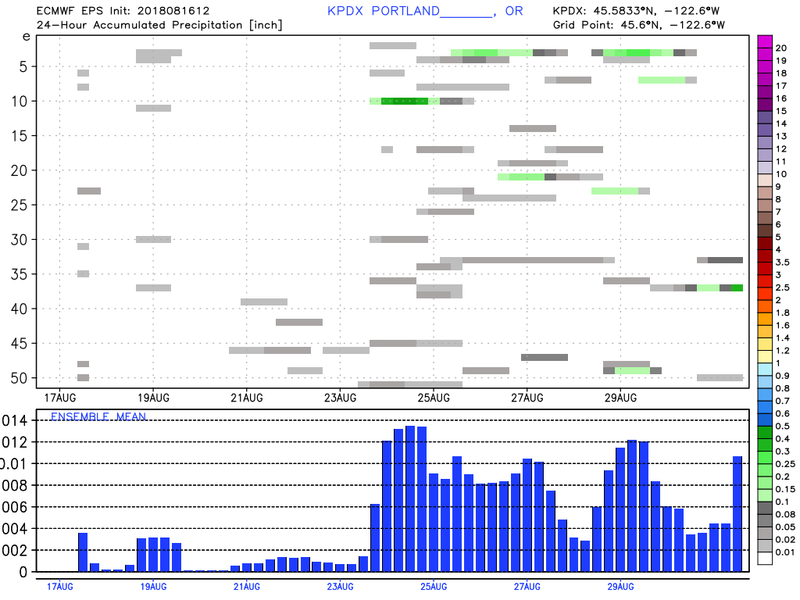 Only a little over 1″ of rain in Portland during an entire third of the year! 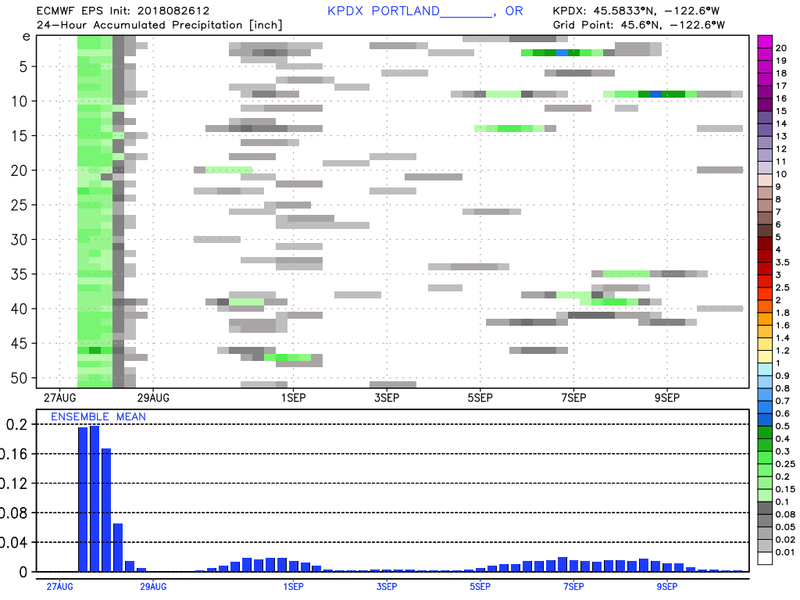 This dry spell (late spring through all of summer) is unprecedented in Portland, Salem, Olympia, & Seattle. In all these locations it’s never been drier from late spring through the entire summer season. In most years we get some sort of soaking rains in May, June, or later in August. But not this year. Records at Salem go back 126 years! ter that only a few members show some showers in the first week of the month, but just real light stuff. 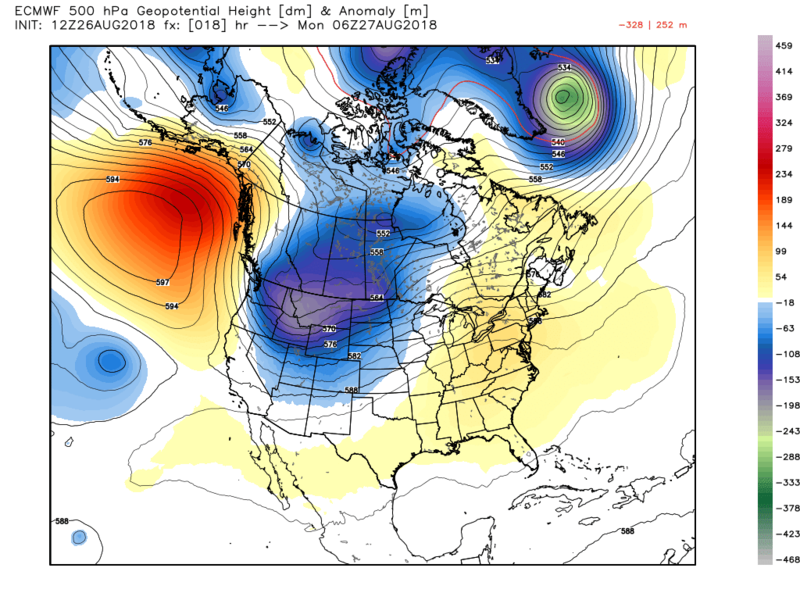 A similar setup with lower than normal heights over much of the western USA. 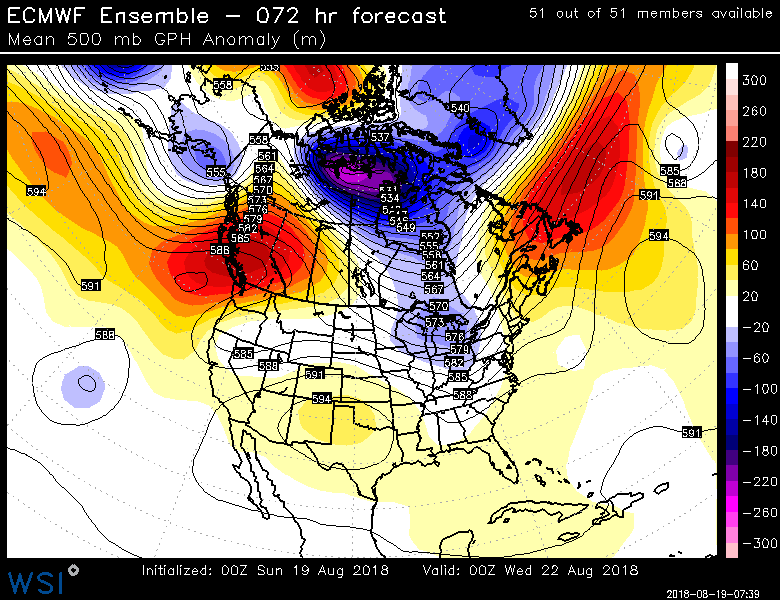 Nothing too unusual here; just that the hot ridge and high heights are gone for the next 7-10 days. So enjoy the early taste of fall…in some years we plunge right into this weather from this point forward. Other years the heat returns at times in September. We’ll see. What about tomorrow? I think temperatures will soar quite a bit higher for two reasons. We had weak onshore flow today, but pressure gradients are switching now and we’re headed into one day of gusty offshore easterly wind tomorrow. That alone would raise our temps 5 degrees or more. 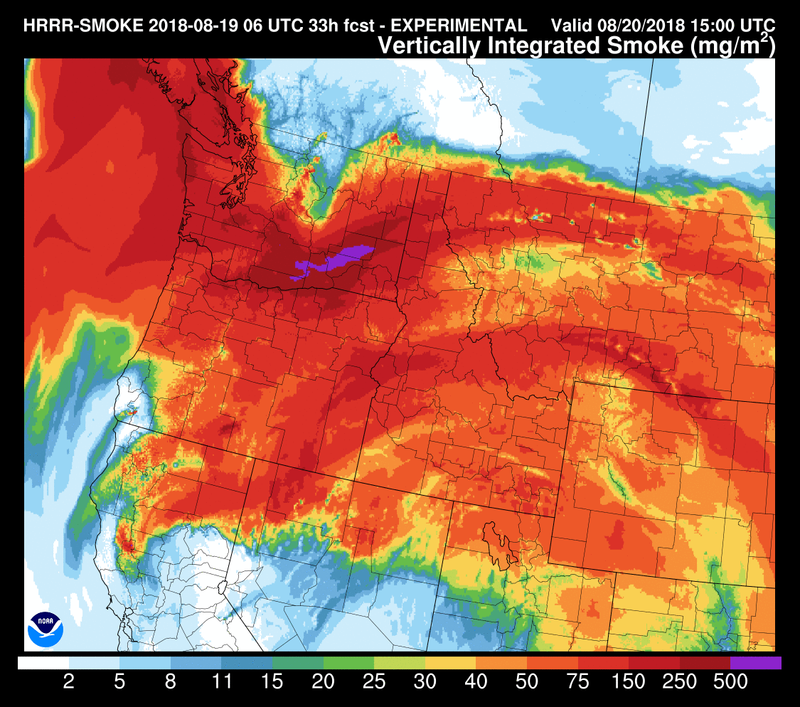 There are strong hints from the HRRR smoke modeling that smoke will thin significantly tomorrow afternoon. That’s due to the strong easterlies bringing clear air from Montana westward all the way to the Cascades and beyond. 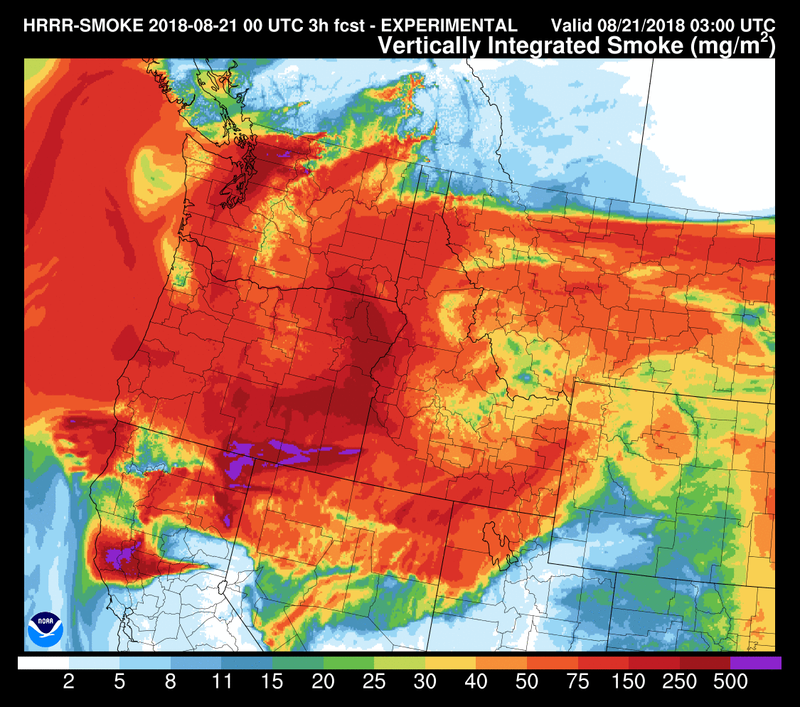 Check out the current smoke forecast for right now; widespread thick smoke across all of Oregon and Washington. Much cleaner air just across the border in Canada. Look at that punch of cleaner air moving through much of Eastern Washington and right down into NW Oregon. 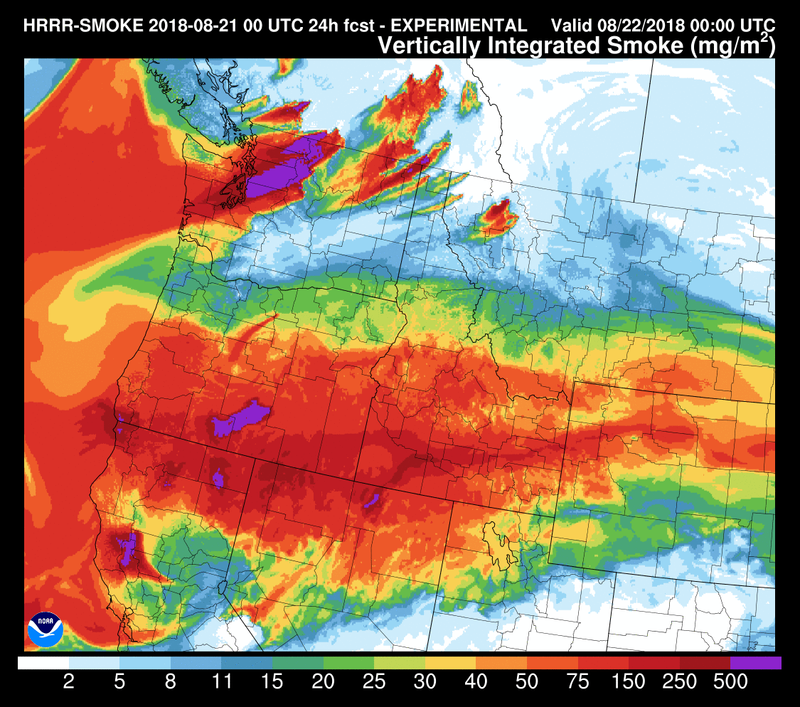 NASA’S GEOS-5 model shows a similar situation with smoke thinning the next 24 hours. Looking ahead, it’s very obvious we have a sharp turn towards fall-like weather beginning Thursday. It’s not that we’re suddenly going to turn rainy with highs in the 60s, but there’s no sign of a return to 90s or even 80s through the end of August (just 10 days away). 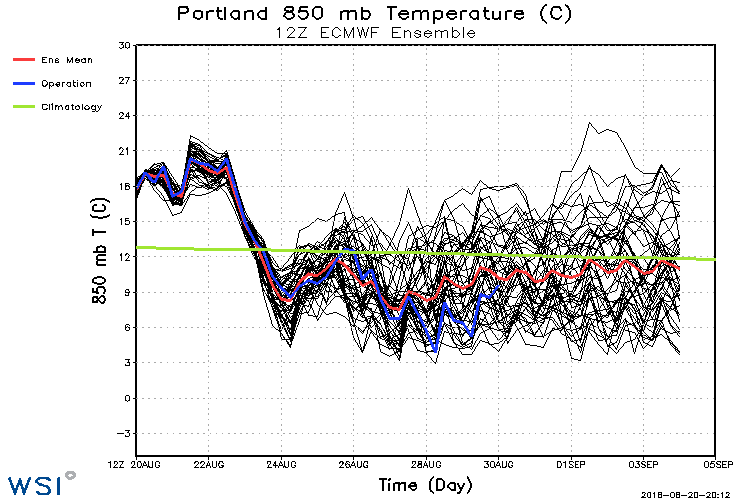 Check out the ECMWF ensemble chart for 850mb temps for the next two weeks. 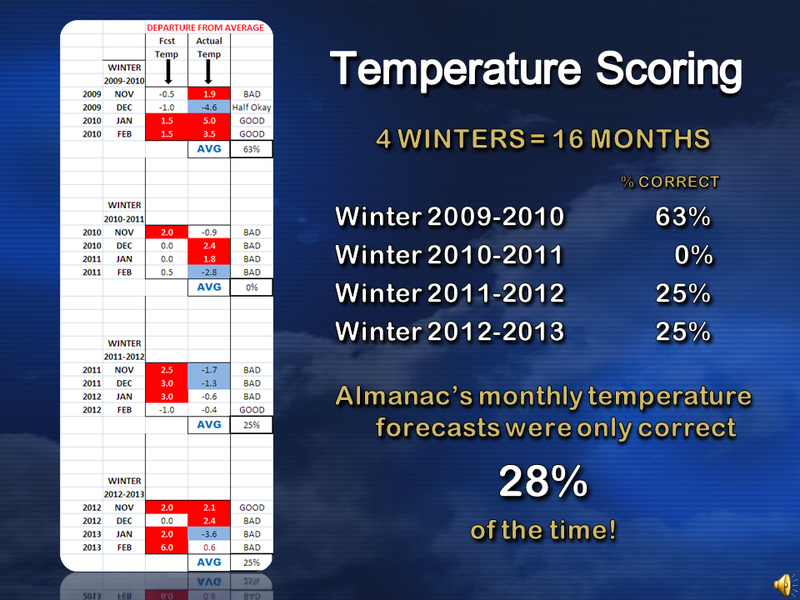 Very good agreement that we’re headed into a much cooler period. The green line is the average temperature at that elevation around 5,000′. Notice most of the time Thursday and beyond the forecast temp is below that line. Red is the average of all the ensemble members. If this is the case, we’re done with the endless warm-hot days of summer and headed into a early fall pattern. Unfortunately at this point I don’t see a good chance for a big soaking…the ECMWF average rainfall for this entire period is less than 1/2″ of rain. Still, this weather will put a damper on fire behavior…baby steps toward the approaching wet season. I’ll be off the next few days, but back at work Sunday. Things should look quite a bit different by then. I’ve ignored weather maps during my weekend, but this morning I see three highlights while perusing weather maps with my coffee. The first is that we’ve got another brief period of hot weather coming, although once again the heat won’t be too extreme. We don’t get long heat waves in late August and this will be no different. Highs reach right around 90-95 or so Monday-Wednesday. Today should be fine. Just a bit warmer than yesterday with highs in the mid-upper 80s. You’ll notice a little more fire smoke than yesterday, and in parts of the metro area the air quality has gone downhill again. We’ve got weak onshore flow today, keeping those temperatures in check. Notice the easterly flow on the cross section forecast for Tuesday. The colored areas are relative humidity above 70%, see how the marine layer disappears Monday PM and Tuesday AM. “21/12” on the chart refers to 5am Tuesday. “20/12” is 5am Monday. Yuck! 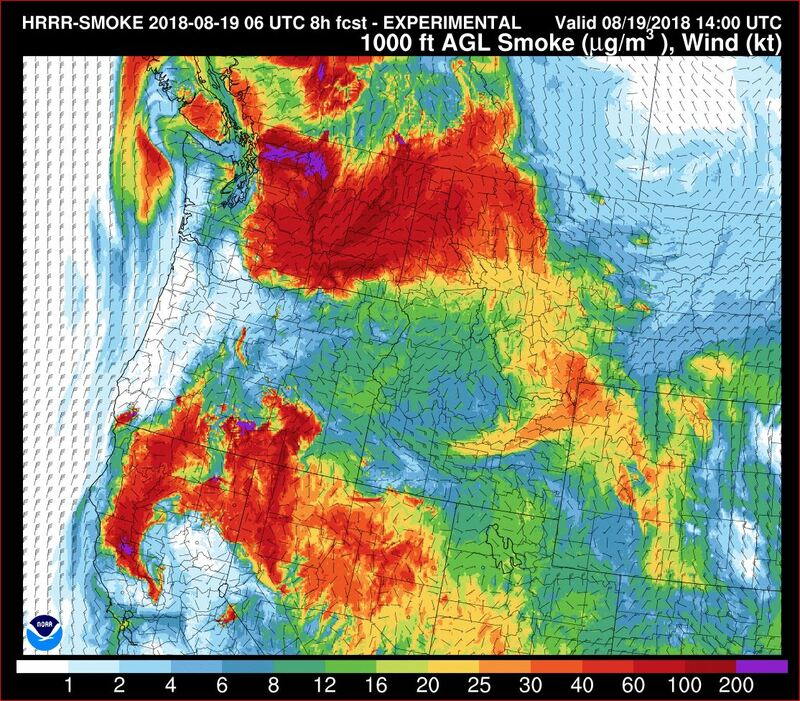 I just checked the HRRR smoke modeling and it shows smoke from all those fires in northern Washington pouring back down over us just like it did last week. The loop is here: https://tinyurl.com/hrrrSmokeModel Here’s the image for right now. and then the image for tomorrow morning around 8am…you see the northeast flow has brought the smoke right down over us again. The smoke will be with us Monday-Wednesday (3 days), then a HUGE change is showing up on all models the latter half of the week…looks like FALL! 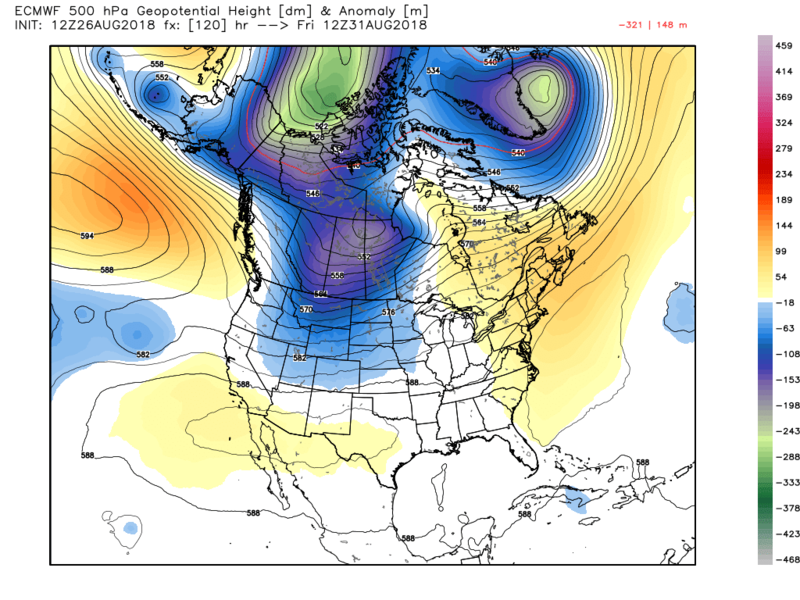 A cool upper-level trough over Western Canada and the Pacific Northwest. 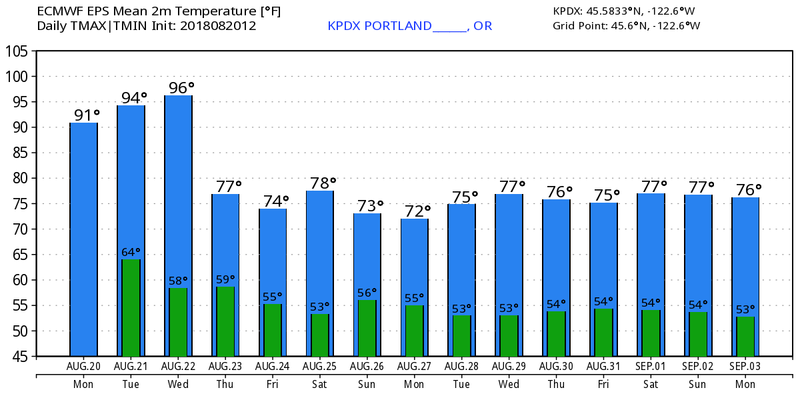 This screams “end of summer weather” for at least 4-5 days starting Thursday. A thick marine layer Thursday and beyond means you’ll need to get used to lots of morning (or all day) clouds and spots of morning drizzle at times. High temps will drop at least down into the mid 70s. This late in the season a thick marine layer with AM drizzle can keep us in the upper 60s too. 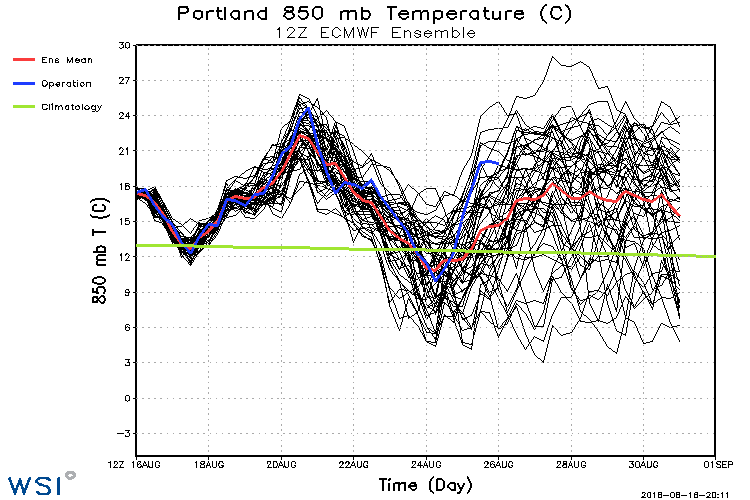 Here’s the ECMWF ensemble meteogram for Portland; quite a change eh? Looks pretty comfortable! It’s not like we’re entering a cool & wet period, but the chance for showers definitely goes up at times beyond Thursday, or maybe it’s better to phrase it as “guaranteed dry weather goes away for a few days. Notice temps do rise slightly beyond Sunday, back to normal which is in the upper 70s the last few days of August. I’ll be back at work today (I work Sunday-Thursday), forecasting on the 5, 8, 9, 10, & 11pm shows…I shouldn’t be hard to find! Today has been refreshing…brief morning clouds and then cooler temps. 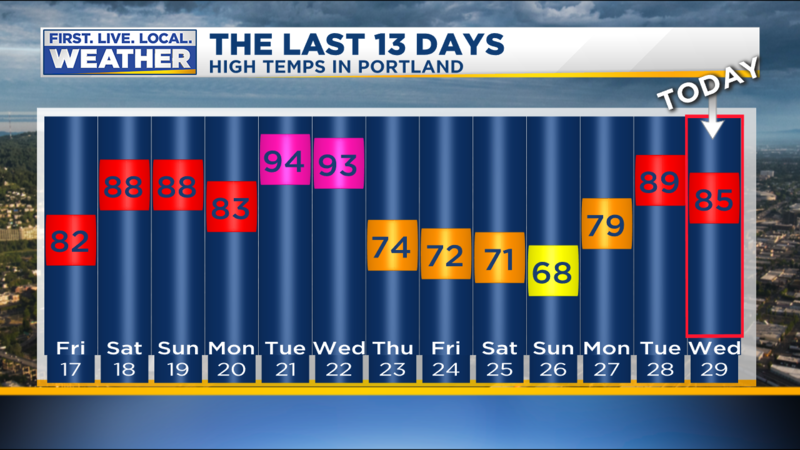 We hit 83 in Portland this afternoon; down from 89 yesterday and 90s on Monday and Tuesday. You probably noticed there is still high-level smoke overhead, evidenced by the yellowish sunshine. Even that goes away Friday as upper-level winds turn westerly for a few days. We are getting another push of marine air this evening and models show low clouds coming up mainly the Columbia River for a gray start in much of Cowlitz, Clark, and Multnomah counties Friday. After that you can expect a very BLUE sky overhead since that smoke should be gone. 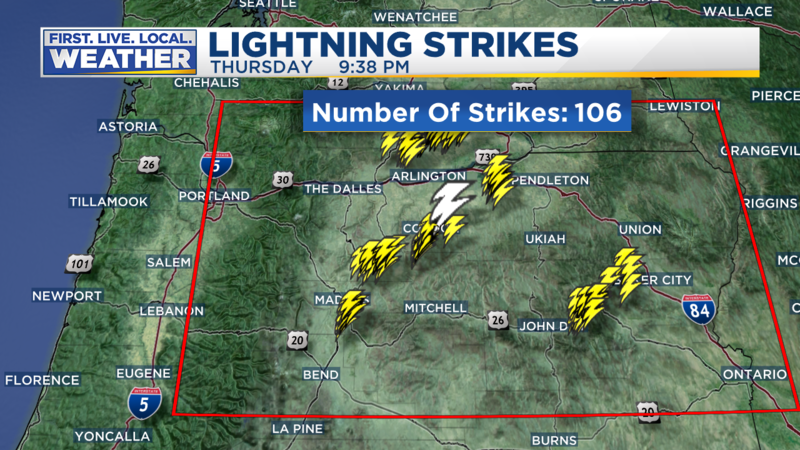 Many of these are producing very little rain so obviously this is a huge concern for fire starts. Hopefully new fires remain small. I saw what appears to be a new fire producing a large smoke plume just southwest of Summer Lake earlier this afternoon on GOES-16 imagery. What’s ahead? 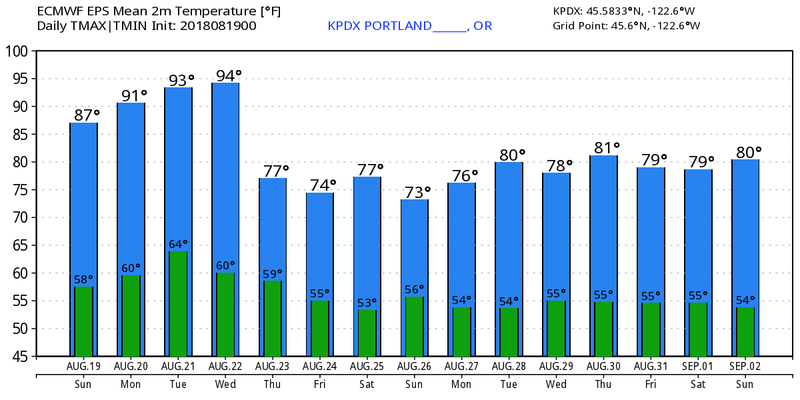 Typical late August weather…a little heat, but cooler periods as well. It’s pretty obvious we have passed the worst of summer. That is normal for us. Nights are getting longer; giving us cooler nights. In fact even the middle of the metro area should drop into the mid 50s tonight and tomorrow night. Nice. 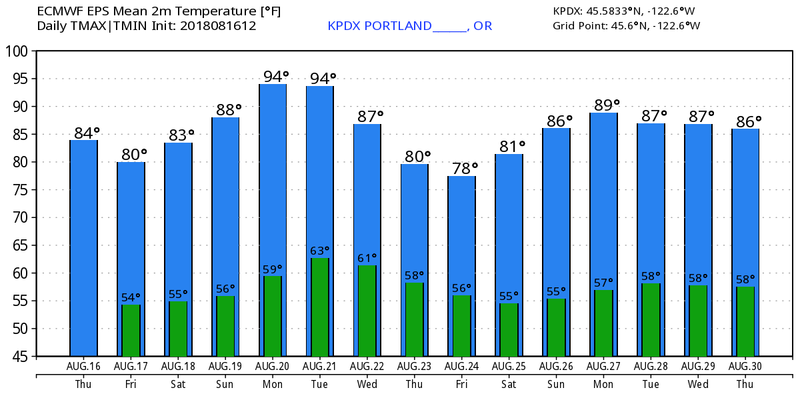 There should be one more brief hot period Sunday-Tuesday, then cooling again later next week. Notice the good agreement on the ECMWF ensemble chart; a peak around Monday/Tuesday, then quite a dip later next week before more warming. Rain? Unlikely we’ll see anything other than sprinkles out of marine clouds the next 10 days. 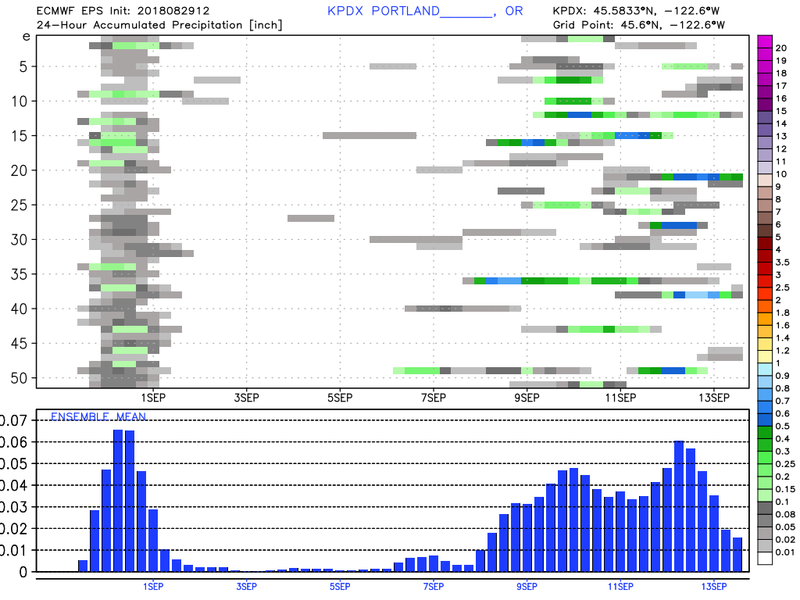 Only 6 out of 51 ensemble members bring .10″ or more to Portland in the next 2 weeks. 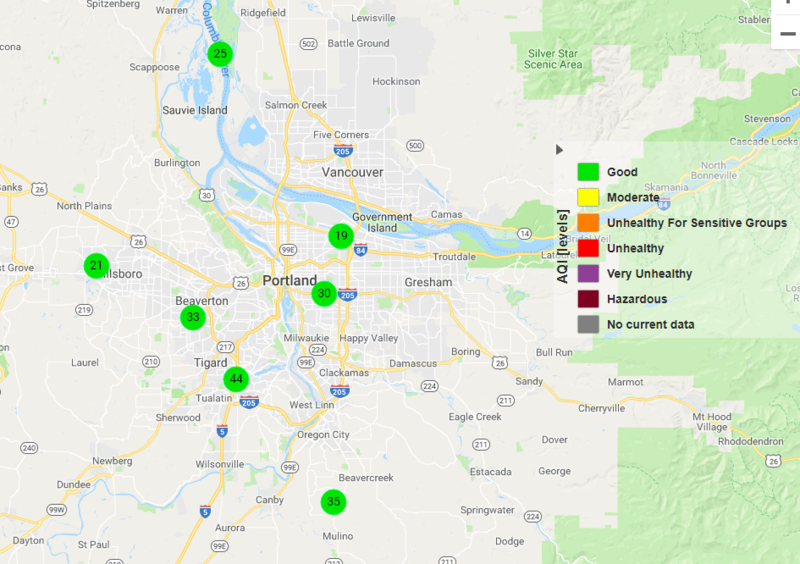 Air quality is in the UNHEALTHY category across the Portland metro area and Columbia River Gorge this morning. Up until this point we’ve only seen smoke high overhead. Easterly wind has brought smoke from Eastern Washington down into our area. It should clean out quite a bit tomorrow with a switch back to westerly wind. Air quality sensors from Oregon DEQ show UNHEALTHY air over us right now due to those smoke particles. 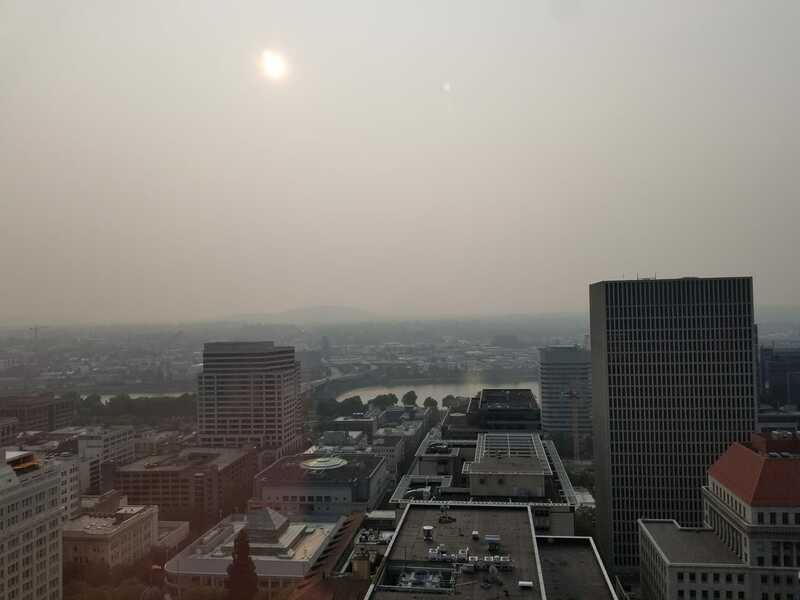 Notice it only extends into the metro area with cleaner air down in the Willamette Valley. The easterly flow this morning is the strongest we have seen since June. Wind has been gusting up around 40 mph the past few hours at Crown Point in the western Gorge and Corbett was just about the warmest place in the metro area last night…only briefly dipping into the upper 60s due to mixing from the wind. The one HUGE benefit is that the smoke layer is going to keep temperatures well below what we would typically see with this airmass. We have easterly offshore flow plus an 850mb temp of +20 on the morning sounding at Salem. Models are forecasting +22 by this afternoon. Under blue skies I would forecast a high of 100 this afternoon. I think 90-93 is more likely due to the smoke…hot, but nothing crazy hot. You are currently browsing the FOX 12 Weather Blog blog archives for August, 2018.